Spring Lake New Jersey bed and breakfast, The Sandpiper Inn Bed and Breakfast. 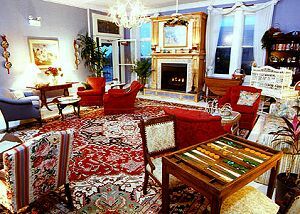 The Sandpiper Inn, in Spring Lake, NJ, is a unique bed and breakfast offering all the amenities you'd expect from a large hotel, but with the congenial atmosphere of a gracious home. The Sandpiper Inn bed and breakfast is Spring Lake at it's personal best: elegant but casual. The Sandpiper Inn is not your traditional 'bed & breakfast' but rather a unique inn offering all the amenities you'd expect from a large hotel, but with the congenial atmosphere of a gracious home. The Sandpiper Inn boasts 15 bright, airy, spacious guest rooms with twelve-foot ceilings and sitting areas - the majority with ocean views of the Jersey Shore. All lodgings are air-conditioned and each has its own private, modern bath, many with Jacuzzis.